Here are 55 (minus title) that I hope are not too enigmatic for Marian’s Flash 55 prompt on With Real Toads. This poem has been edited since posting so maybe is a bit less enigmatic now. (The earlier version relied on the title more and just referred to remembering as “it” in the poem). I appreciate that the photo doesn’t exactly match the poem! And that it probably is too “short,” cutting off trees. But I took it in my visually-impaired way the other day in upstate New York, and I very much like the crinkled ice at the bottom, the freeze happening on a windy night. This entry was posted on December 7, 2014 at 8:18 am and is filed under poetry, Uncategorized. You can subscribe via RSS 2.0 feed to this post's comments. Wonderful to feel so much a part of the other so you cannot tell if who is who.. sounds symbiotic almost. Indeed you are lucky if you feel that way. Hey Bjorn– thanks for your comment as it makes me realize that the poem was a bit obscure since I wasn’t focused so much on the couple as to how memories and old sufferings change and we are no longer clearly their primary characters–old dramas. I have changed the poem but it still may not be quite right! Thanks! K.
Yes,, now at second reading and with that change it comes through for me .. Thank you. 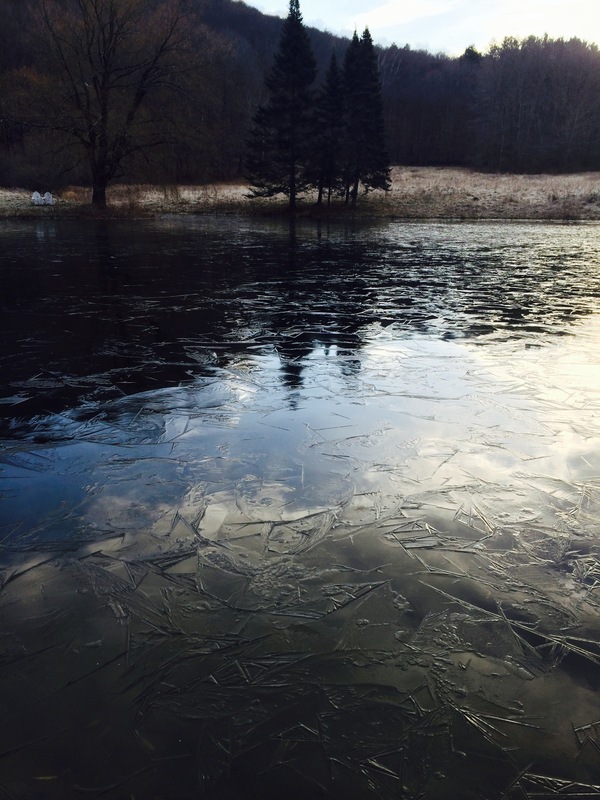 I think the cold crinkle of ice perfectly matches the mood you have captured in your poem. Such a tender spot is touched by your words… enough to bring a tear to the eye. Thank you so much, Kerry, for your ever thoughtful and considered (and kind) comments. k.
ohhhh, yes it is like that. it really is. and stays. You picked the perfect gesture for that moment of grace. I think the ictureis right too–dark with light reflecting from or causing–cracking ice. I felt a soft breeze of enlightenment as I read. Time does that to memories. The feelings are not as sharp or clear but some muddled inkling of something. Just perfect. Very thoughtful words and the photograph is beautiful…love the focus you chose for it. Sweetly sentimental and … is it forgiving? Lovely. Remembering can be exactly like that! Perfectly drawn. Memory can be such a cloudy issue, In scenes I’ve always thought of myself as the main event it would seem I’m not.